We provide Gulf Shores real estate of all types to buyer and we list homes for those wanting to sell. The kinds of real estate available for sale are waterfront homes, condos, townhomes, waterfront property, villas and homes for sale. By far, the majority of available Gulf Shores real estate listings are condos, as is commonly the case all along the Gulf Coast. There are many great beach houses and homes as well as waterfront real estate and water view properties available. Gulf Shores is on an Alabama island on the Gulf Coast in the Gulf of Mexico just West of the Florida state line and adjacent to Orange Beach. 20 Miles to the West of Pensacola. 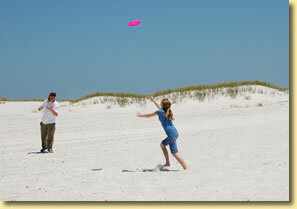 Beautiful sugar white sand beaches and clean water enhance the ambience of the Gulf Shores environment. Here this natural paradise provides miles of unspoiled white sand beaches, dunes, sea oats and diverse wildlife life are commonly seen along the coast here. Although this area was impacted by Hurricane Ivan, this area has fully recovered and is again a great place to live or vacation. The up side of the impact of previous tropical activity has been better stronger building codes and constructions techniques to mitigate any future potential for damage. In other words, older or poorly constructed structures are probably gone now and newer construction is generally superior to older construction.